When I was working at the Seattle Rep a few years ago, one of my self taught projects was to learn how to screen print. I learned the basic process and ended up making t shirts for my prop team and also for all the other interns. 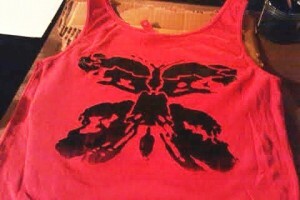 Two Christmases ago, I bought myself a screen printing kit so that I could do it at home. It then took me another year to get the kit out and start a project. I’m not going to give a detailed description of every step, just a general one. But, the kit I purchased came with a great video that describes the details and you can find many tutorials online if you are interested in learning more. I started by trying to figure out what kind of image I wanted to make. In December, I came up with a fun idea. 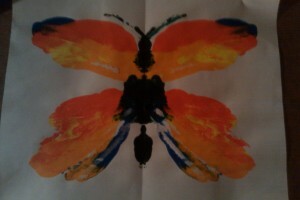 I would do some kind of wacky butterfly. 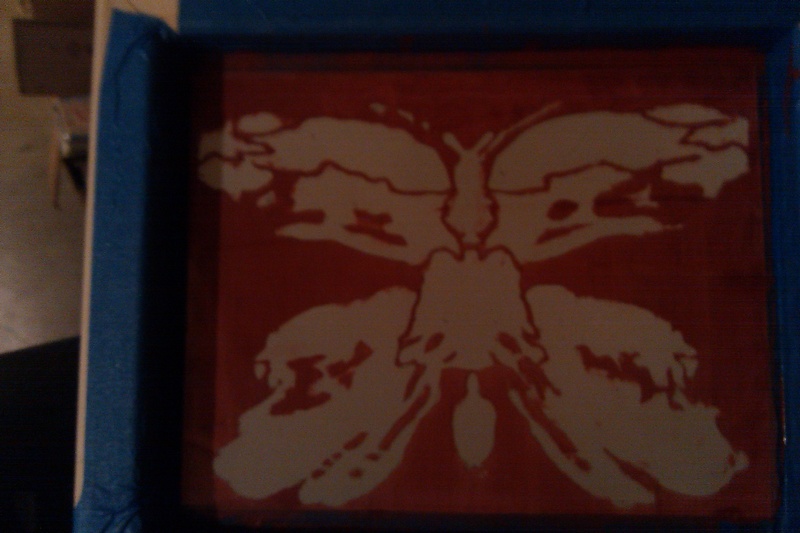 So, at a craft night with the girls, I brought some paint and paper and tried to make butterfly images using the old Rorschach method. I put the paint on one side of the page, folded the paper in half to smoosh the paint on both sides, and opened it again to make a fun, mirrored image. 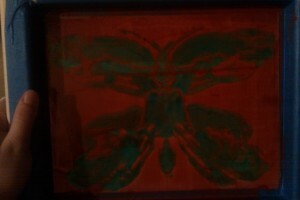 Above is the butterfly image I liked best. 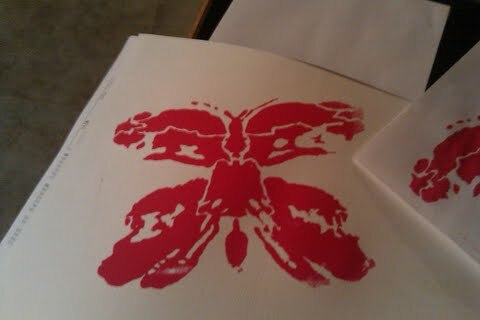 So, then I took it home and put it underneath my screenprinting screen. 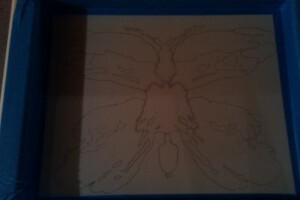 And I slowly sketched out the lines of the butterfly with a pencil onto the screen. I tried to make sections and lines created by the different colors on the original. Once that was done, I (painstakingly) filled in my new image with a blue substance called drawing liquid. 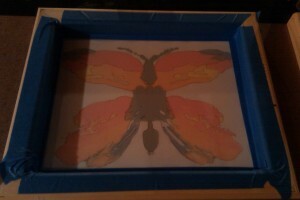 With the drawing liquid, you cover all the areas that you want to show up when you do the screen print. Once that was dry, I used my squeegee to cover the whole screen with screen filler (that’s the red stuff). The way it works is that the screen filler doesn’t stick to the drawing fluid. So, once the screen filler is dry, you can rinse out the drawing fluid. and you get a screen like this! Whew! That’s a lot of drawing and drying and such. After I finished my screen, I stopped working on this for a few weeks. I don’t know why. I did all the hard parts and not the fun part! So, Sunday night I pulled it together and made some prints. The first one, I did on some nice thick paper with magenta acrylic ink. The image turned out so well! I love the way that it looks. It is detailed and messy looking at the same time. It is a rugged butterfly. Then I used the fabric ink to do a print on a tank top of mine. How cute is this!? Now that I’ve started with the screen printing and have actually created some prints, I’m excited about doing more! And, this means that I’m already on my way to accomplishing one of my goals for the year. New crafts, here I come! Hi there, I discovered your web site by means of Google while looking for a similar subject, your website came up, it appears to be like great. I’ve bookmarked it in my google bookmarks. Hi my loved one! I wish to say that this post is amazing, great written and include almost all important infos. I would like to look more posts like this . Hiya, I am really glad I’ve found this info. Today bloggers publish only about gossips and net and this is really irritating. A good blog with exciting content, this is what I need. Thank you for keeping this site, I’ll be visiting it. Do you do newsletters? Can’t find it. With every thing that seems to be building inside this specific subject material, your viewpoints are fairly stimulating. Nonetheless, I am sorry, but I can not subscribe to your entire strategy, all be it stimulating none the less. It looks to us that your commentary are actually not totally validated and in simple fact you are yourself not even thoroughly convinced of your assertion. In any event I did enjoy reading through it. Excellent goods from you, man. I have understand your stuff previous to and you’re just too great. I really like what you have acquired here, certainly like what you are saying and the way in which you say it. You make it entertaining and you still care for to keep it sensible. I can’t wait to read much more from you. This is really a tremendous web site. I do trust all the concepts you have introduced on your post. They are really convincing and will certainly work. Nonetheless, the posts are very quick for beginners. May just you please lengthen them a bit from subsequent time? Thanks for the post. whoah this weblog is great i love reading your posts. Keep up the great work! You understand, lots of individuals are looking round for this info, you could help them greatly. In this great design of things you actually get a B+ with regard to effort and hard work. Exactly where you actually misplaced me personally was in the details. As as the maxim goes, details make or break the argument.. And that could not be much more true here. Having said that, permit me tell you what exactly did deliver the results. The text is certainly incredibly persuasive and this is probably the reason why I am making an effort in order to opine. I do not make it a regular habit of doing that. Next, although I can certainly notice the leaps in reason you come up with, I am definitely not confident of exactly how you appear to unite the ideas that help to make the actual conclusion. For now I shall yield to your issue but hope in the foreseeable future you connect the dots better.